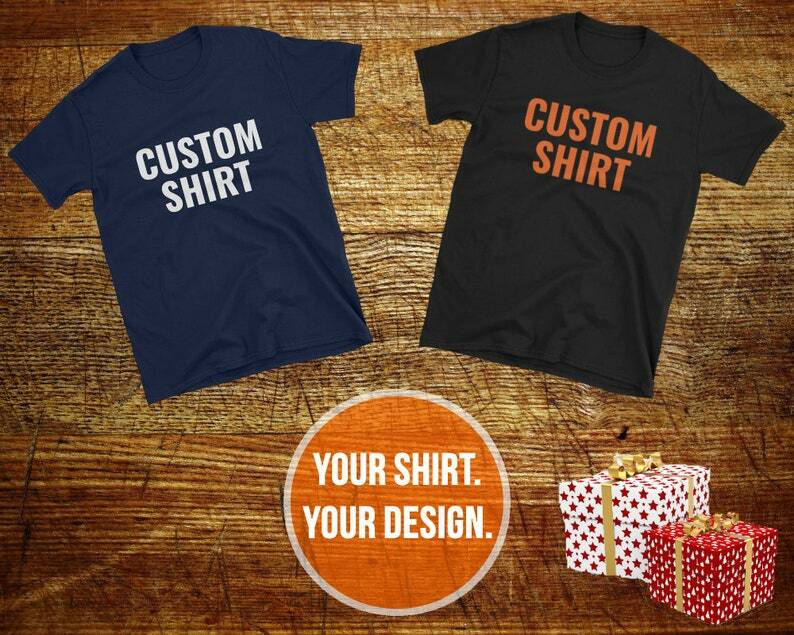 Custom shirts are always awesome gifts for men and gifts for women! Personalized T-shirts are perfect for Business Branding that will only increase profits since you will be making everone aware of your great Business Logo! I will add your awesome high quality design or personalized message or popular quote on the front or back of your Super Soft T-shirts! You could be totally done with your Christmas shopping list right now with meaningful Christmas gift for everyone and Matching Family Shirts! Make your own Shirt! The perfect custom gift for the holidays is always a great hit at parties. The shirts are Unisex so there are shirts for women and shirts for men. Black or Navy tshirts are available. Need your very own business logo shirts? Maybe you need a bunch of matching family shirts or custom event shirts? Design Your Own Shirts and Create Your Own Shirt today! Want your logo or graphic design on your shirt on the front or back? You and your friends are sure to love some cute shirts with your own cool "inside joke" tees or tshirts for your all Greek event for your college's fraternities and sororities! Before you order, please message me your design ideas whether it is a trendy motivational or fitness inspiration quote or a complex design idea! I will create your shirt however you want it and will walk you through until you are 100% satisfied! Very communicative seller. Good shipping time. I would recommend this seller/ product and I would purchase from again and I will. Jim with ilivelifeill was great to work with on this custom shirt. Very pleased the shirt and would recommend ilivelifeill to others! Came quick and fits perfect! During the holidays shipping may take longer than usual. Refunds will only be made for misprints. What are some good reasons for returns? It is best to contact us before returning any products. We do not refund orders for buyer’s remorse.